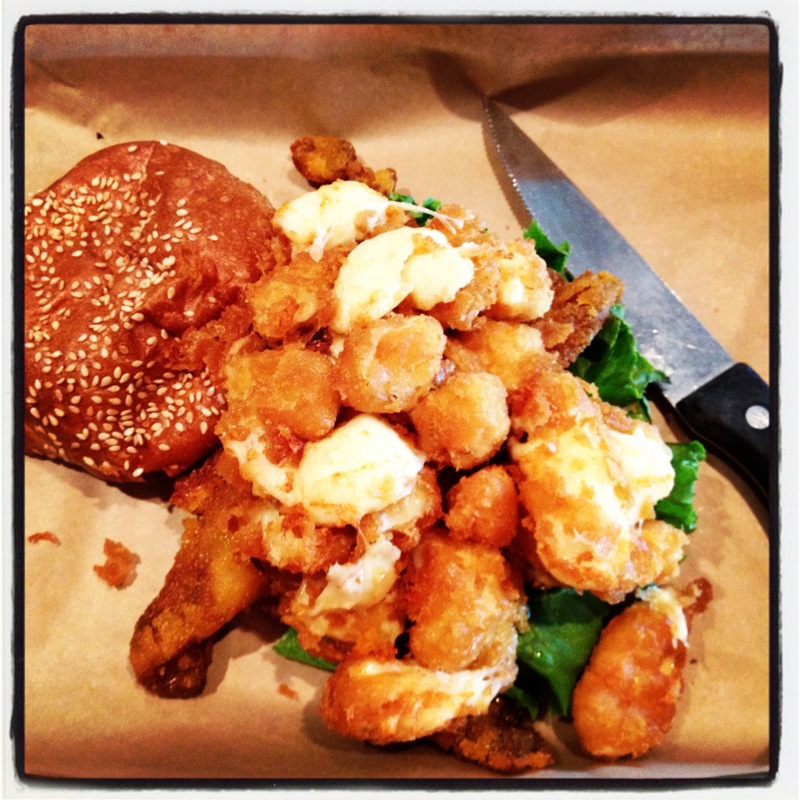 Burger Jones is a classic, but trendy burger joint located close to Lake Calhoun in Uptown. They specialize in creating a unique menu of Angus beef burgers finished with a unique blend of toppings. For those who are not big fans of meat (myself included) they can whip up a mean veggie burger as well. Along with amazing burgers, Burger Jones has killer waffle fries that are a must. To wash it all down, order up a drink. They have everything from a wide selection of craft beers to specialty cocktails. My fiance is a meat kind of guy so he instantly loved it. His burger of choice was the “White Trash”. Yep, that’s the actual name and you’ll have a chuckle when you see the names of other burgers. The “White Trash” was just about one of the most artery-clogging, heart-attack-waiting-to-happen burgers that I have ever seen…I had to have a bite! (see image below) Not only were the cheese curds, literally, prepared to perfection in all their cheesy goodness, but the chicken-fried bacon just made the burger. It was that good and after talking with a college friend of mine, who also happens to live around Lake Calhoun, she agreed that the “White Trash” is what you must order on your first trip to Burger Jones. Got a real appetite? It comes in a double wide size. The White Trash Burger via Burger Jones. Now for those of your who would rather not eat meat or if you just want to be adventurous, let’s get to the veggie burger (seen below). Personally, there’s nothing better than a good veggie burger. They have so much flavor due to the ingredients used to make them and they can be paired with nearly any topping. 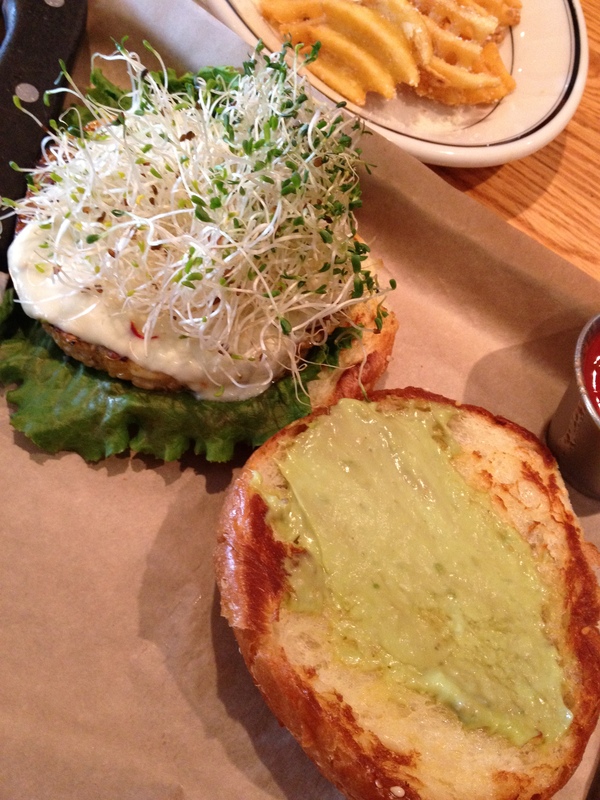 The Southwest Salsa veggie burger was topped with, wait for it, chunky garden salsa, pepperjack cheese, avocado mayo, and fresh alfalfa sprouts. Could it get any better? Not only did they have all of my favorite toppings, but they put it on a veggie burger! I just about died and it tastes as good as it sounds. Southwest Salsa Veggie Burger via Burger Jones.